Help : Common System Definition - Only one Record - Do not add additional records. Help : Common System Definition. ID Range Start Start of the ID Range used The ID Range allows to restrict the range of the internally used IDs. The standard rages are 0-899,999 for the Application Dictionary 900,000-999,999 for Application Dictionary customizations/extensions and > 1,000,000 for client data. The standard system limit is 9,999,999,999 but can easily be extended. The ID range is on a per table basis. Please note that the ID range is NOT enforced. Encryption Class Encryption Class used for securing data content The class needs to implement the interface org.compiere.util.SecureInterface. You enable it by setting the COMPIERE_SECURE parameter of your Client and Server start scripts to the custom class. 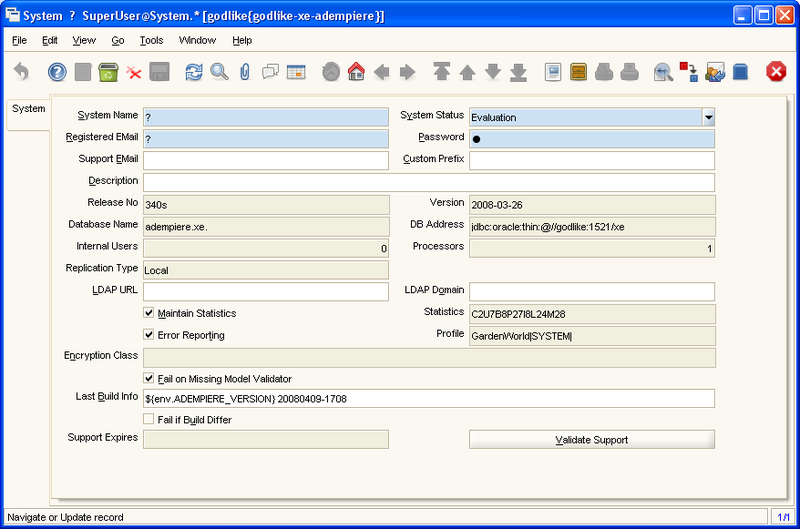 This page was last modified on 22 February 2008, at 06:51.